With Punisher #10, the Omega Effect story shifted from planning mode to action mode, making for a less complicated read than last week’s Avenging Spider-Man #6, but every bit as enjoyable. This issue is also very funny, with Spider-Man supplying enough one-liners to make me chuckle out loud more than once, especially in his scenes with the Punisher. Next, all four rendez-vous before going into action. 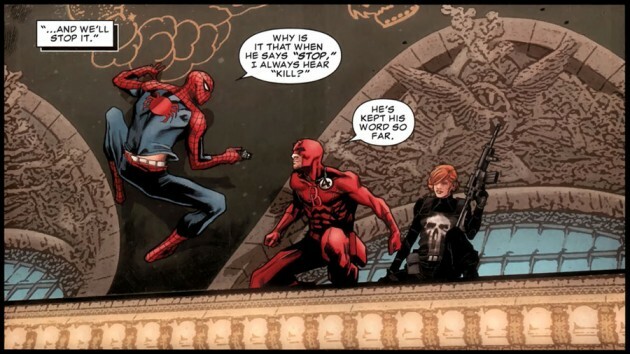 Daredevil takes the time to try to reach out to Cole, which – as we’re about to find out – is a futile mission. Spider-Man has about as much success in trying to appeal to Punisher’s softer side. The second half of the issue is all action and ends with a delightful and twisted cliff-hanger that is just what this event needed going into the final issue with next week’s Daredevil #11. This is a dynamic and perfectly paced issue that does a great job of respecting all of the characters’ individual personalities, traits and conversational styles. Again, the art is fantastic. Marco Checchetto’s characters have great proportions and show a variety of poses that look perfectly natural. He has a real knack for action as well as quieter moments and I really dig the way he draws superhero costumes in a way that makes them look like real garments with seams and folds. I also want to give two thumbs up to Matt Hollingsworth’s colors that set the perfect tone for the various indoor and outdoor nighttime environments. I’m still not loving the seams in the clothes, although it was amusing seeing Spidey’s shirt untucked.